You’re running (or have great plans to run) a different sort of business. It’s a business that is going to make the world a better place. Maybe you’re a holistic practitioner, a life coach, a permaculture practitioner, a local coffee shop, local food business, restaurant or yoga studio. And yet, you’re not getting the response you want (lots of amazing clients!). Instead, you’re finding that most people are either confused by what you do or apathetic to it. They don’t get how special and valuable it is. If you’re reading this, my guess is that you already know (or have been told) that at the root of your struggles to get enough clients, is this: the lack of a clear, profitable niche. You know that having a solid niche is the key to getting a steady stream of the kinds of clients you like, increasing your income, raising your profile, getting way more word of mouth and referrals than you’re currently getting and becoming known as the go-to person in your field . . . all with a fraction of the effort you are currently expending. Your niche is your role in the marketplace. It’s what your business is known for. It’s that tricky but all important combination of what you offer, how you offer it and to whom you offer it. And, as the marketplace becomes more crowded with people doing what you do (or something so close that the marketplace can’t tell them apart) you probably know, or at least suspect, that figuring out your niche is no longer an option. I predict that, over the coming years, it will be one of the most talked about trends in the conscious business scene. If you haven’t already, you’ll be hearing every business and marketing coach talking about it more and more because, if you don’t have a clear niche, what they are teaching you won’t work. Every hour you spend clarifying your niche will save you ten hours later. Every dollar spent on clarifying your niche will bring you back ten. So, you know this but, despite trying hard, you haven’t figured yours out yet. And, if you’re honest, you resist the whole idea. Past approaches you’ve tried to figuring out your niche haven’t worked out (or have felt confusing, uncomfortable, daunting, painful, rushed, constraining, pressure filled and stressful). I’ve written a new book to help make the whole process easier. 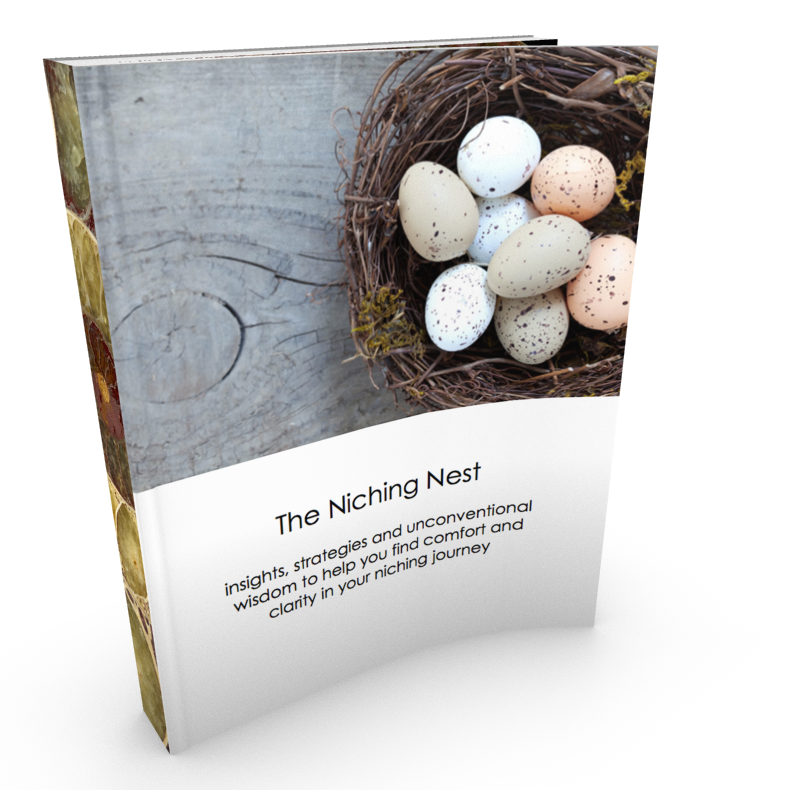 It’s called The Niching Nest: Insights, Strategies and Unconventional Wisdom to Help You Find Comfort and Clarity in Your Niching Journey. You are struggling to figure out your niche (and maybe have been for some time). You know niching is important but you aren’t entirely certain you really understand what a niche is in the first place. You have sat there with a hot cup of coffee, a blank piece of paper on the table and a pen held loosely in your hand and tried to figure this out on your own – hoping inspiration might strike, only to find yourself hitting dead end after dead end. You are feeling increasingly embarrassed that you haven’t got this figured out yet. If any of the above are true for you, you’re not crazy and you’re certainly not alone. You are a marketing or business coach who has been looking for an affordable resource you can offer to your clients to help them identify their niche with less resistance and less of your personal time invested in the process. Who am I and why did I write this book? My name is Tad Hargrave and, after a decade of running my business Marketing for Hippies and working with hundreds of entrepreneurs from all around the world, I realized that the central issue at the root of 95% of their marketing woes was that they didn’t have a clear, workable, profitable niche. Early on, many of them had no idea what niching even was (although, with each passing year, more and more of them have walked in the door having already encountered this idea in some other marketing course they’d taken). Some knew, but didn’t realize that it was the reason they were struggling. Some knew it was at the heart of their troubles in theory but I began to realize that they didn’t really know what a niche was, what a good niche looked like or how to get one. I also realized that I didn’t know a lot about how to help people to figure theirs out. And neither did most of my colleagues. Some knew but had given up. After years of trying hard but still failing to figure it out, they had mastered the art of utterly avoiding the issue (only to be tapped on the shoulder, none too gently, by the apathy of the marketplace and reminded how confusing and generic their business has become). Ugh. That’s a hard moment. Regardless of where people were in their business struggles, the one constant absence was the presence of a clear niche. The first eBook I ever created was about niching. I didn’t want to create it, but I truly couldn’t find anything out there that made sense to me (which is, in itself, a lesson about how niching works). In the early days, I would spend a solid hour of my weekend workshops on this idea of niching. And then a full morning. And then a full day. Finally, one weekend, we spent two days on niching. And it still wasn’t enough. They were deeply discouraged. And I didn’t blame them. They were lost in the woods alone with no map and no support. They were out of ideas not only on what their niche might be but how to even approach the issue. Those who weren’t discouraged yet, were terrified of it. After all, niching means we need to narrow our focus, make choices, and stop trying to appeal to everyone. For many reasons, obvious and otherwise, this leaves many entrepreneurs in a cold sweat. Those were the seeds of this work. But there were other seeds too . . . There were those beautiful moments at workshops when we would solve this issue for them. And it was like a switch got flipped. The room would come alive, ideas started flowing, ridiculously attractive offers virtually created themselves and the questions of ‘where to market?’ and ‘where do I find clients?’ became immediately and blindingly obvious. The entrepreneur in question would breathe an incredible sigh of relief while beaming with excitement as the path before them became clearer than it had ever been as if the sun had suddenly appeared and the clouds had vanished. It might sound dramatic, but that’s how it was. I wanted to help those lightbulbs go on for people more often. I remember leading one of my early workshops in Seattle, asking people to pick a niche for their business. In my mind, it made sense. You need a niche to successfully market so . . . just pick one. I was, of course, greeted by many a deer-in-the-headlights look, and some incredible resistance as they stared at the blank page before them and tried to imagine what might fill it that wouldn’t feel like cutting off a limb. How could it be that the journey of niching, for so many entrepreneurs, began in terror, moved to overwhelm and ended in discouragement? That was the sobering and eye-opening sentiment out of which The Niching Nest was born. My hope is that, with this book, I have brought something different to your table. This book is the result of a solid year of writing and re-writing, testing and trying out ideas, working directly with over 100 entrepreneurs, teaching these ideas in workshops and wrestling them down to the mat with the help of trusted colleagues to see if they had any worth at all. People struggle with niching because they don’t really understand it. They have so many misconceptions about it. And because they don’t understand it, it’s stressful and ineffective and so people give up (and so they should). In some ways, it’s less that they struggle with niching and more that they’ve never actually tried. It would be like someone driving a tractor around a field and then, months later, wondering why they have no crops coming in. It’s not that they did a bad job at farming, it’s that what they did isn’t farming at all. This is what I see with niching. People thinking they’re doing it when what they’re doing is the farthest thing from it. Many people come to niching hoping for an epiphany. But, given how fickle even the best of muses throughout history have been, hoping for insight is not a very reliable strategy. It’s easy to be seduced by the idea that one day you’ll hit a home run and figure it all out. And it may happen that way. But making this your plan is part of the problem. I began to see that the frustration of “I just want to figure this out once and for all” was actually their biggest barrier to figuring it out. I saw that what was needed more than anything was patient persistence. Not planning on home runs, but going around the bases one at a time. When people really grasp what niching is and isn’t and have a step by step process that works, niching can be effective and feel good too. The Niching Nest is divided into three critical sections, each one building on the one before it. You’ll discover 52 ideas that underlie my approach to niching. 52 ideas designed to help you find a workable niche more quickly and with less drama. One idea for every week of the year. 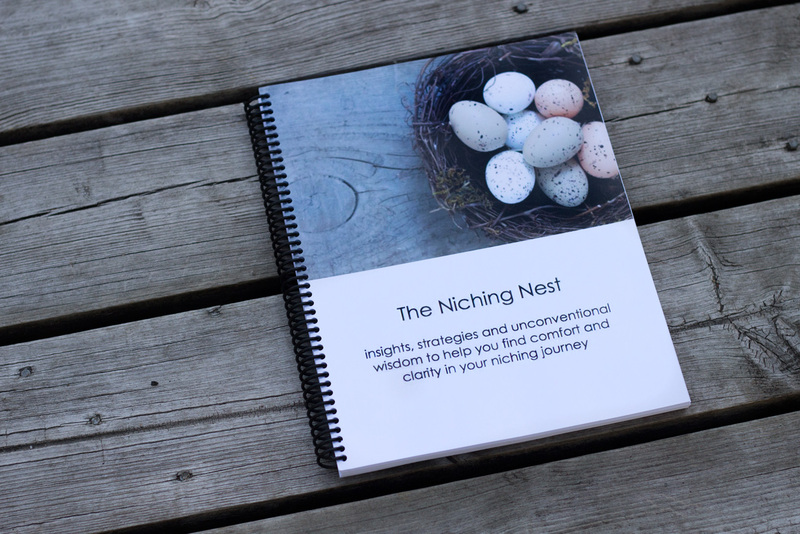 The word niche comes from the old French verb “nicher” which means “to make a nest.” And so, each idea is like a twig or bit of mud that you can use to build a nest to hold you as you go through the often uncomfortable journey of finding your niche. I believe that people struggle to find a niche largely because of the lack of understanding of these 52 ideas. What are these ideas? Check out the Table of Contents to find out. Over the years, I have come to see that, before engaging in the discovery of what their role in the marketplace might be, there were important conversations to have. There were vital ideas that needed to be introduced to hold people, like a nest holds a hatchling in its early days. What niching actually is (thirteen ideas here). What niching definitely isn’t (seven ideas here). Why it matters in the context of marketing and why it is not, in fact, the terrifying proposition. You might currently be imagining it to be (seven incredibly stress reducing ideas here). How to get started in going about niching (twenty-five lucid, compelling and strategic ideas here). If Section I is what you need to build the nest, then Section II offers some basic blueprints with which you can actually get started on your nest building. 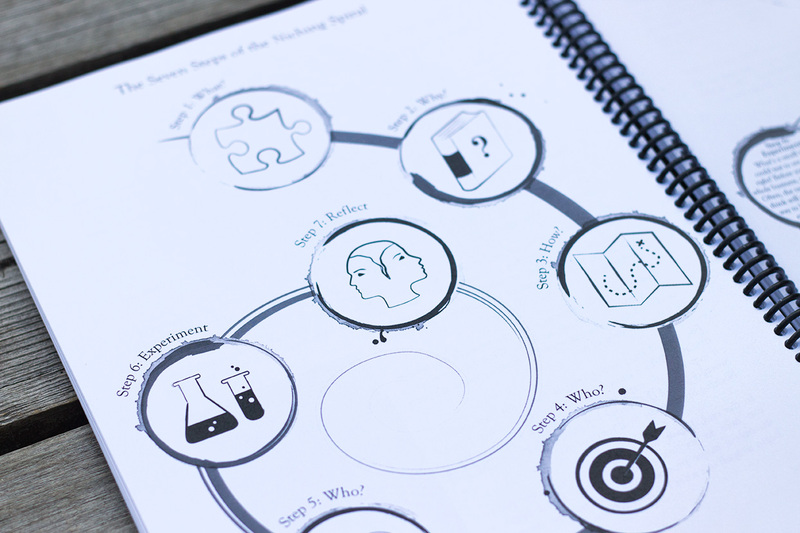 A nuts and bolts, ongoing, seven-step, refreshing, sustainable and common sense process I came up with to help you make progress on figuring out your niche (especially if you’ve been struggling with it for years). The difference between the Artist’s and the Entrepreneur’s approach to niching. I think this book is worth it for this one chapter alone but there are eleven more chapters in Section II. The three levels of a workable, profitable niche (most entrepreneurs I meet are lucky to have one of these levels sorted out. Most aren’t aware of more than two of them at best). You’ll read my candid thoughts on how I see niching related to the broader movements for social change. This is my favourite part of the book. PLUS, at the end of many of the ideas and strategies, you will also find some Additional Resources listed where you can dig deeper. Without the slightest risk of hype or exaggeration, this may genuinely be the most useful part of the entire book. By the time you finish with this 213 page book, you’ll know more about niching than most marketing coaches and feel more confident than you can imagine in your niching decisions. I hope you’ll consider getting a copy for yourself and maybe as a gift to a colleague of yours to share. I’ve poured a decade’s worth of learning via a year’s worth of writing into this book. I’m immensely proud of it. I hope you’ll find it useful in bringing more comfort and clarity into your niching journey. The eBook for $20 (only PDF. Kindle & e-reader version coming soon). Why this book? Because niching is hard. The two qualities I have found that seem to characterize the whole process of niching for most people are confusion and discomfort. Many people have been struggling with this question of ‘What is my niche?‘ for years. And it can be immensely painful. The Niching Nest starts with an understanding of niching that is not common: that your niche is not simply your brand or target market but your role in the community. CLICK HERE to Order the HardCopy, Spiral Bound, Black & White Edition for $40 + shipping. Benefits of a real book? Indulge your page-turning, corner-bending, highlighter-wielding, book-smelling bibliophile. Throw care to the wind and write in the margins! Circle words! Stay up too late reading it by candle light when you should be sleeping. Throw that thing in your carrying bag and read it on the bus and in cafes you’ve been meaning to go to. You know you want it. If you have any questions, I hope you’ll feel free to email us at admin (at) marketingforhippies (dot) com.